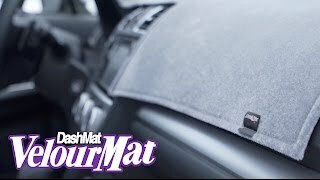 Our VelourMat has an elegant and soft feel that provides a stunning look while providing superior coverage to your dash. By protecting your dash you are preventing your dash from cracking, fading, or deteriorating. Each dash cover is custom-made for a perfect fit with all the right vent and sensor cutouts to ensure your no vehicle functions are limited. Add a personal touch to your VelourMat by adding embroidery, logos, or even officially Ford licensed logos.